Description Of Item: These sweetly twisted, irresistible dead dolls from beyond by creators Ed Long and Damien Glonek keep you dying for more. This series includes GregGORY the ventriloquist with his dummy, Daisy Slae, the hippy girl with dreadlocks and Dee K. the zombie along with their friends Jasper and Alison Crux. 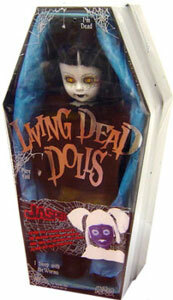 Each doll is packed carefully exhumed in its own coffin with a unique death certificate.